Welcome to The Abso!ute Sound online! We explore music and the reproduction of music in the home. We believe that the sound of music, unamplified, occurring in a real space is a philosophic absolute against which we may judge the performance of devices designed to reproduce music. Our goal is to provide the resources consumers need to judge how a component's sound either honors or departs from the music's truth, and to make sound purchasing decisions that maximize their experience of reproduced sound. 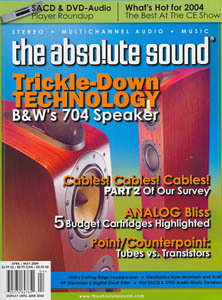 Below is our Issue 147, April / May 2004 table of contents and editorial. Chris Martens listens to five entry-level phono cartridges. A long-time fan of B&W speakers, Sue Kraft listens to the British loud- speaker manufacturer’s new 704's and concludes that, in this case, the trickle-down theory does work. Join our roundtable as The Absolute Sound’s writers and editors ponder, discuss, and argue all things audio in the first of a new series of colloquia. This issue finds Robert Harley, Wayne Garcia, HP, Paul Seydor, and Jonathan Valin weighing in on the merits of tube versus solid-state electronics. Come fly with us to that city in the desert for a gander at the coolest gear at the 2004 Consumer Electronics Show. affordable speaker cables with models from Acoustic Zen, AudioQuest, Cardas, DH Labs, Nordost, PS Audio, Supra Ply, WireWorld, XLO, and... Home Depot! Shane Buettner listens to the latest batch of high-rez digital disc-spinners. This cost-effective integrated amp is all-Krell all the way, says Wayne Garcia. Few companies have had equal success building both tube and solid-state gear. According to Paul Seydor, McIntosh is one of the best of them. Anthony H. Cordesman listens to a contender for the state of the art in sound and technology. A digital giant killer? Harry Pearson finds one lurking in Italy. Also, moving-coil cartridges — a handful of the best, compared and rated. Paul Seydor reflects on a legend of the American high end.